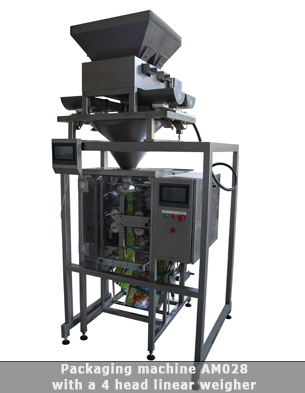 The vertical packaging machine AM028 is used for the forming, filling and sealing of plastic bags. More information related to the working method and overall characteristics of the vertical packaging machine could be found here. Independent cutter. If product is caught between the jaws, the cutter is not actuated which greatly extends its life and product spill is prevented. 7 inch color touch screen interface. Improved sliding system of the sealing mechanism, addopting annealed sliding rods and Japanese linear bearings. This results in extremely low friction and weariness which greatly extends the lifetime of the sliding system. No maintenance needed. Neither grease nor oil should be added. Manufactured from stainless steel, in accordance to the food safety requirements and regulations. Step motor driven sealing mechanism - for better pressure and precission. Direct communications between the machine internal components (no intermediate switches, buttons, relays etc.) for better reliability. The stand-up divice is an additional module which could be turned on and off. If the device is ON, the machine will make stand-up bags. If the device is OFF, the machine will make pillow bags. Packaging material Thermosealable film like PP-PP, PP-PE, PA-PE, PE-PET and others. 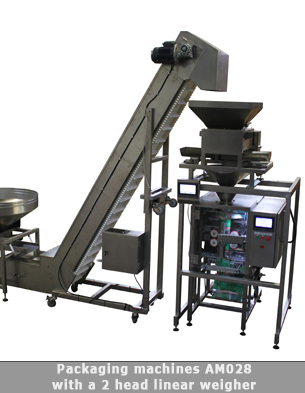 Video 1: Vertical packaging machine AM028, equipped with a 4-head weigher (for sugar, salt, nuts etc). 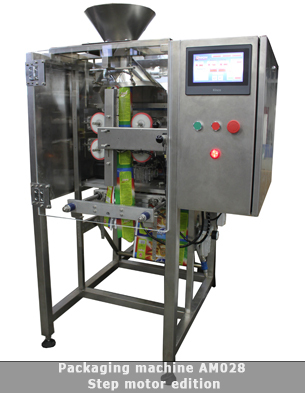 Video 2: Vertical packaging machine AM028, equipped with a 4-head weigher (for chips, snacks, noodle etc). Video 3: Vertical packaging machine AM028, equipped with a 10-head multihead ATD-10. 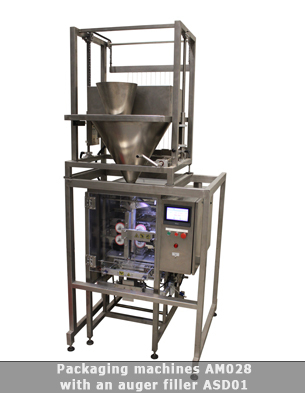 Video 4: Vertical packaging machine AM028, equipped with a screw filler (for powder products.). Video 5: Vertical packaging machine AM028, equipped with a volumetric filler (sodium bicarbonate in video. ).